As you were reading in the last blog entry, I had been contacted by Dean Cornelius with Outlawed Restorations while on my anniversary trip. He was looking to do a photo shoot with one of his personal project trucks called Old Stitch. I love the fact that when he’s looking for a camera holder he thinks of me! It all started about a year ago when I was out driving around and happened by his shop and an old White fire truck caught my eyes. I ended up meeting Dean that day and we have been in touch since. He has talked to me off and on about one day selling Stitch and he was wanting pictures done of it with the new door art which was completed around the middle of last year. 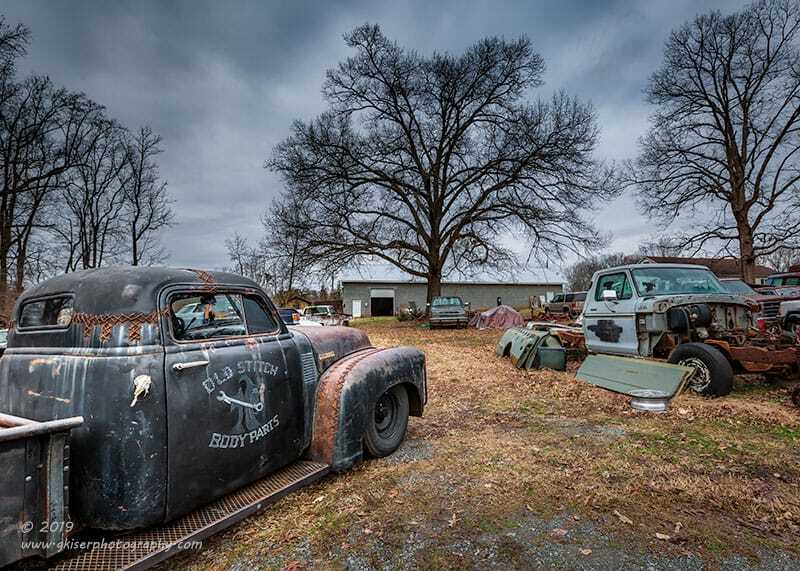 He had been wanting to get out to a salvage yard near his shop to do the photos and it was looking like he had the ok from the owner to make it happen. I knew that I would be off from work for the two days following my anniversary trip and would have no problem shooting Stitch during those days with the exception of the weather. It was going to be much too sunny for me to get the images that I was looking for on this rat rod. You see, this truck has an attitude that really doesn’t belong with a sunny day. This is a Grimm Reaper vehicle and deserves a moody sky. That was meaning that Tuesday and Wednesday were more than likely going to be a wash. It was too early to tell about the following weekend, but when I’m given an assignment I don’t like lingering and waiting. I want to get on it as soon as possible. However, I was on my anniversary weekend and had to put that out of my mind for a few days. I promised myself I would revisit it on the way back home. 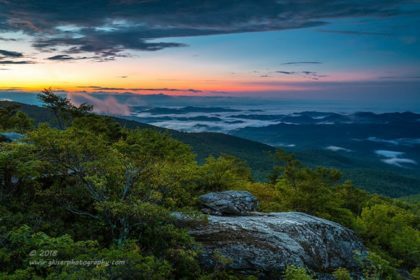 As we were coming down the mountain, I was looking at the sky and thinking how wonderful it would be for the Stitch shoot and how I wished that I could go ahead and get it done when I got home. There were two issues with that plan though. 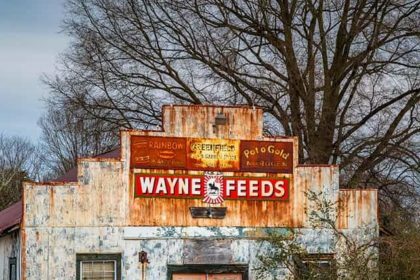 The first issue was that there was no guarantee that the clouds would be the same in Yadkin County, and whether or not they would even hang around that long. The second issue was I was not really in the mood to do any more shooting just yet. I still had two days worth of photos to process and get finalized. I know, that is not very professional of me, but that is the way my creative energy worked. I checked the weather and it was still looking less than favorable for the coming days, so I started to talk to Toni about how to proceed. I was actually hoping that she would say just save it for another day, but instead, she threw me a curve ball and suggested that I go ahead and make it happen since the clouds were in my favor. I went ahead and made contact with Dean, hoping that he would say that today was not a good day, but as I knew he would, he was happy to meet with me to get it done early in the afternoon. 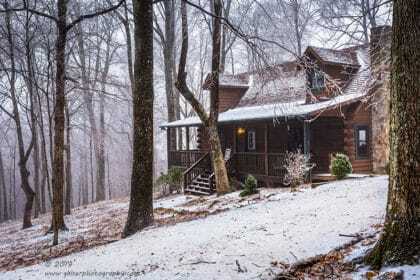 Well, that was settled, I was going on a shoot right after getting home from the mountains. Hey, I guess it is good practice for when I am doing this full time. Days like this will be when business is really good! I spent a good portion of the trip home getting my mind set for shooting Stitch. At least I was familiar with the truck, and have shot it on a couple of other occasions. I knew the attitude, I knew the details, and I had seen a lot of the details added on by Dean over the past year. That really helped me so much when it came to knowing how I wanted to capture this truck. I knew that we were going to be a salvage yard so there was going to be wrecked cars around, and probably a fair share of clutter. I embraced this as ambiance, and continued looking to the sky. 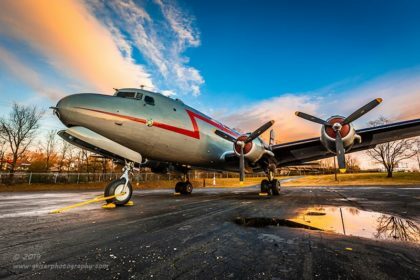 That was going to be the key for this shoot, and I knew that I was going to do everything that I could to accentuate the drama and moodiness in the sky. This truck is over the top cool, so why not blow out all the stops and give it the rendering that it deserves? 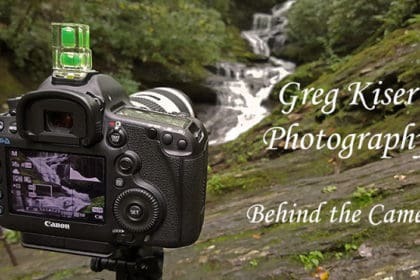 When we got home, we got the truck unloaded and I transferred the camera gear over to the car and after a real quick break, I was on my way right back down the road I had come in on. 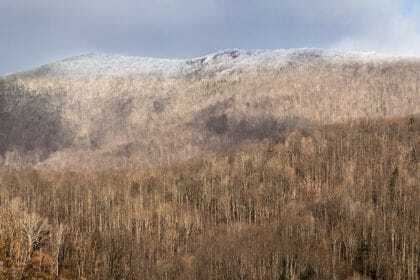 I arrived at the shop shortly after 1pm and was happy to see that the clouds were still hanging around, although it looked like they were thinning just a little bit. I was committed at this point and was going to see this through, so I just crossed my fingers that the sky didn’t open up any more than this. When I rolled in, Dean came right out to see me and we caught up a little bit. I checked out a restoration that he was doing on a pickup, and then checked out a suspension job that he was doing on a ’49 Chevy Deluxe. There is always something cool going on in this shop! I got a little more information about what his expectations were for the pictures and decided that this was really going to be a fun shoot as opposed to one where I just checked off the boxes of things that needed to be captured. Whether it is a good or a bad thing, he trusts me to get the shots, and he really likes my style. We had a few options about how to shoot this truck. The easiest would be at the shop where we already were. I have shot here numerous times and I know some great angles that can be used. 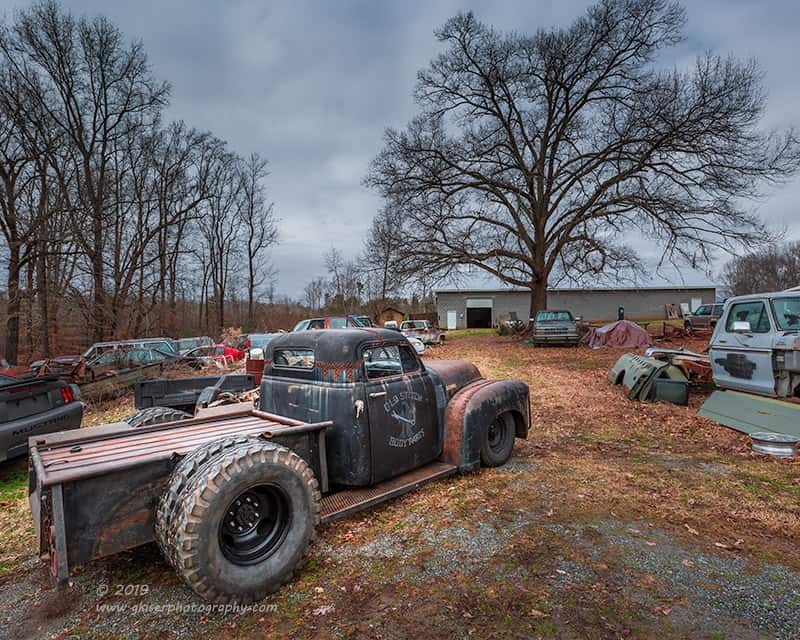 However, I think that Dean’s idea of shooting in a salvage yard really helped to tell the story of this old gal. I was intrigued with the concept and opted for the smaller location for a bit more intimate approach to the shoot. We could have gone to the larger yard, but I could predict some issues with doing that not knowing what natural elements were in place. We set off down the road to the shop which was owned by a friend of his. I got to follow in behind this monster of a truck which was another part of the puzzle I wanted to get to know it a little more before trying to capture it. It didn’t take long before we were there and I got to see the location for the first time. My first impression was that this was a very tight location and the cars were in generally good shape and there were a lot of late model cars in key locations. I also saw a bunch of potential subjects for a later time if I chose to come back to this location. Spoiler alert, I intend on going back there again. The lighting was very good here, and there was a lot of angles where I could get the sky which was very important for me. There were a couple of ways that I could get the truck situated to showcase some of the wrecks in the yard so I was fully onboard with this location. I was starting to really get into the moment by this time and I was getting excited about pulling the camera out. But, before I could do that, I had to do something that was rather difficult for me, and that was positioning Stitch where I thought the best compositions were. This may seem easy, but I have spent the last 14 years photographing things as they are sitting without the ability to move them. Being able to pose a subject is a luxury I am just not used to. After a little bit of thinking I settled on a starting point and Dean pulled Stitch into position. I went ahead and fitted my 16-35mm lens which would be great at capturing the group of cars as a background. I added my Singh-Ray Color Combo Filter as that is so important to automotive photography. I started to set up some compositions. As an interesting point, my first shot actually cropped off the back of the truck. My thought in doing that was I wanted the door art to be right there at the entry of the frame since that was a big part of what I wanted to capture. If I captured the whole truck, the rear tires would become the anchor and the door art would be minimized. To balance out Stitch, I used the shell of a pickup on the right side of the frame and balanced it out with trees on both sides. I embraced the tree right in the center which created a full on triangle effect to the overall composition that ultimately took the eyes to the sky. I was fortunate since I was shooting away from the sun that the exposure was just fine without any additional filters. However, when I started to shoot from the other angle, that changed. When I started shooting from the other side I had a bit of a brighter sky overhead which caused me some exposure issues. Normally, I wouldn’t care so much, but again, I wanted the door art. Also, I wanted this to be over the top dramatic. I mean look at Stitch…Did I have a choice in the matter? In order to combat that exposure problem, I knew I would need to add an ND Grad filter to control the sky. I also knew that I wouldn’t be able to zoom all the way out with the Singh-Ray Polarizer attached without vignetting when using the Lee Filter Holder. I swapped in my B+W polarizer which is a thin mount and then added the Lee Holder in front of that. I then selected my Singh-Ray Galen Rowell 3-stop ND Grad and checked the exposure. This was actually perfect, but not quite over the top like I was wanting for these images. I added a second 2-Stop Grad for a total of 5-Stops of light reduction in the sky. To keep them from looking odd, I staggered them in front of the lens which gave a very long transition which was placed over the trees. Normally when stacking ND Grads, the effect is completely noticeable which was something I wanted to avoid. in essence, I just created a very slow transitioning 5-Stop ND Grad which was perfect for the effect I was going for. I was getting into the zone at this point. I started to work on some isolations because this thing is full of all kinds of wicked cool elements. Of course, I found the body work fascinating and you can see why Dean calls this creation Stitch. All of the seams look to be held together with metal stitches not unlike Frankenstein. The body was widened, chopped, and channeled. Everywhere there was a cut, you can find stitches. They are not perfect, and are not meant to keep with a defined pattern. They are done just like you would expect them to be done, and they honestly make this one of the coolest trucks around. For most of these isolations I used my 24-70mm lens with a Singh-Ray Color Combo Polarizer. I kept swapping out equipment based on the needs of the shoot. You can reference what was used for each shot in the description. 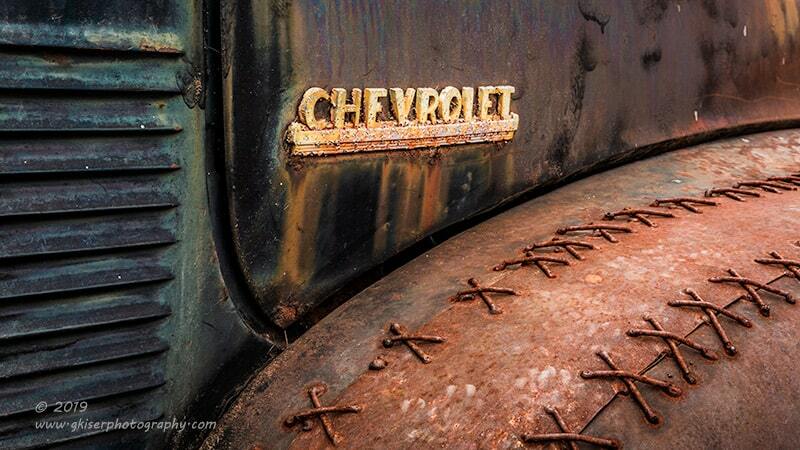 I love the patina on old vehicles and nothing ages metal quite like mother nature. 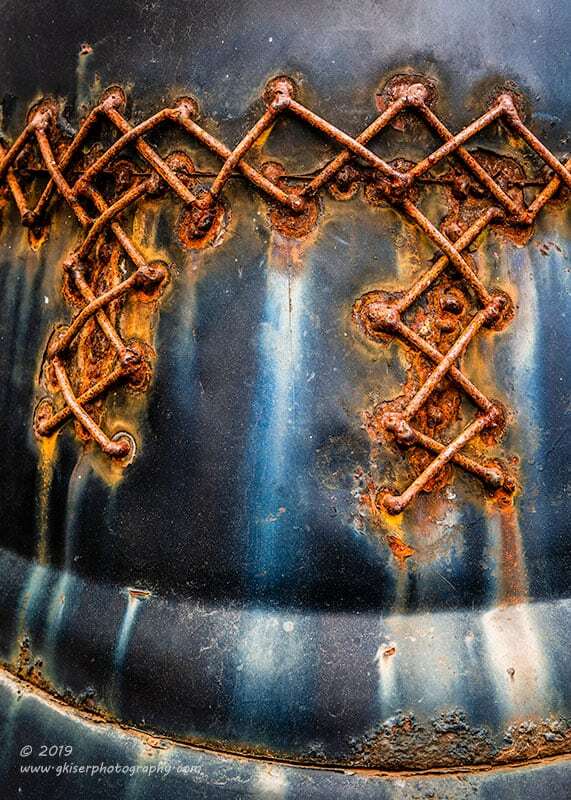 You will never see two examples of rust matching each other. That is part of the character of rat rods. There is no custom paint here, and nothing that was manufactured. How they appear is what a life outside sitting has done to them. 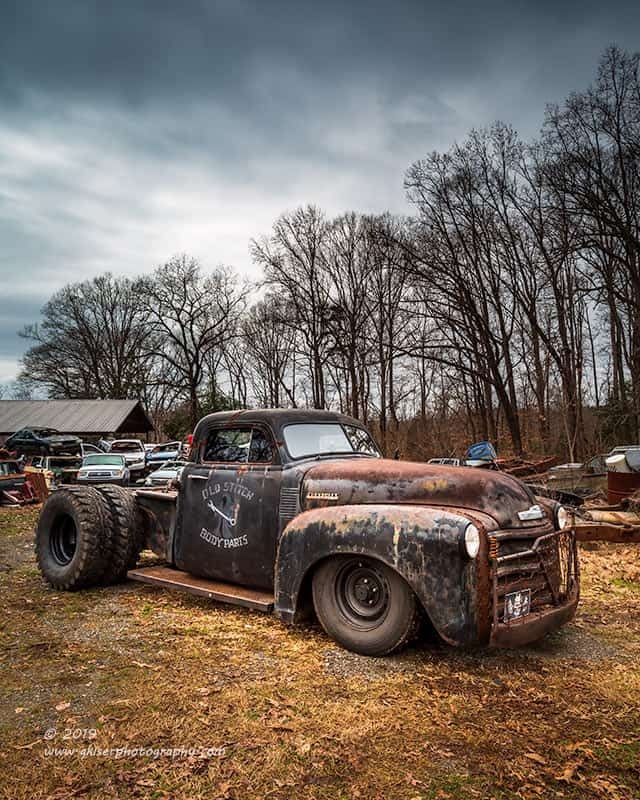 Rat rods are a special breed of vehicle because they have been resurrected, not restored. Nothing is polished on them, they wear their scars with pride as the powerplant pumps life through the chassis. Stitch is no different and Dean has really showcased this concept with not only the patina but the scars of the build. He has even stitched over real scars of age such as from this shot of the hood. 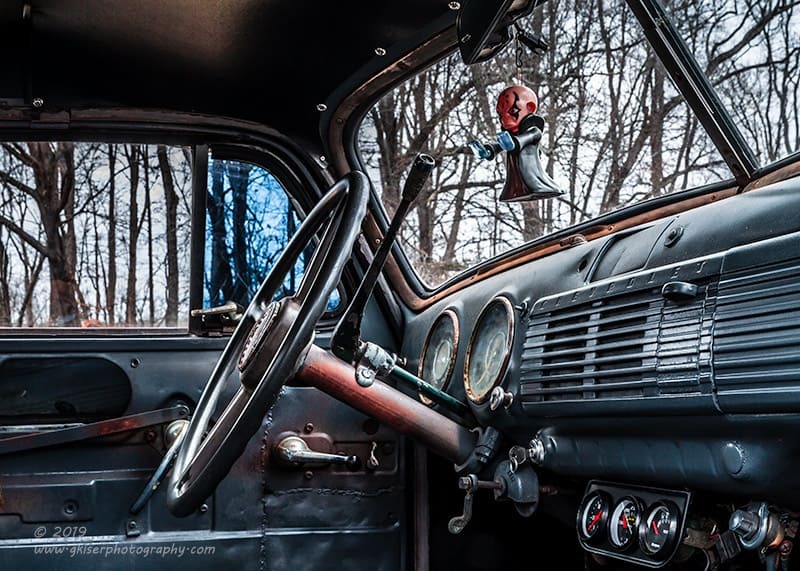 From a photographer’s point of view, this truck makes an excellent source of abstract art with the textures and lines present. Something that is new from the last time I photographed Stitch is the rainbow patina starting to show through on several of the surfaces. It is barely visible to the naked eye, but the Color Combo Polarizer really makes it pop and shine through. 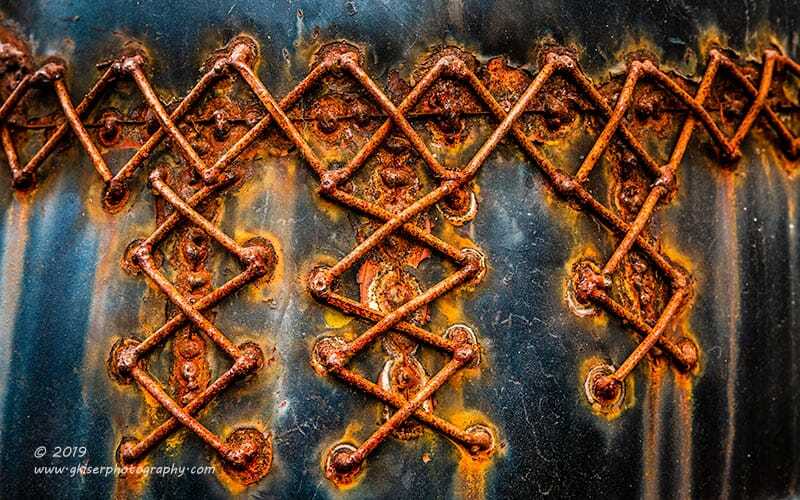 Metalwork, Canon 5D Mk3, 24-70mm f/2.8L Mk2, Singh-Ray Color Combo Polarizer. As you can see, there is just no limit to the abstract potential with this old truck. 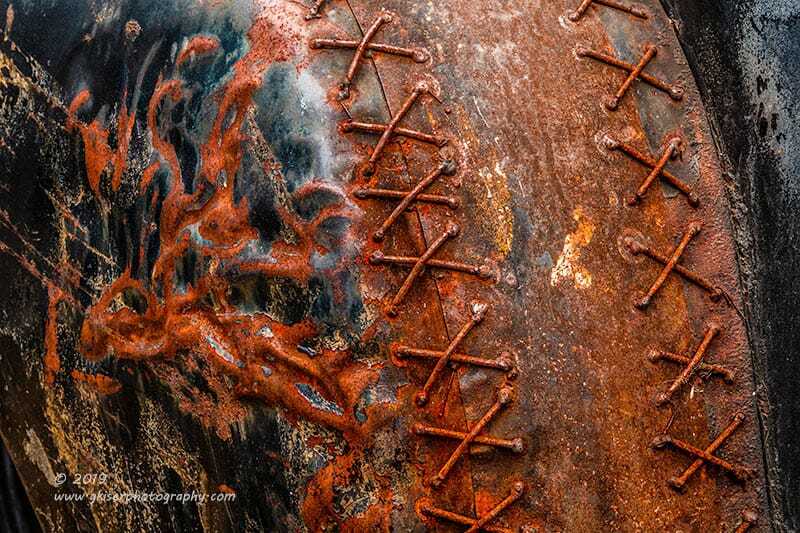 The stitches have taken on a life of their own with their own rust and texture. This is from the corner of the cab where it was chopped to give it that mean attitude. The stitches have even created their own patina as the oxide drips down the faded paint. The blues that start to pop from the paint balance with the warm rust tones so well and really create something spectacular in form and function. I have never seen anything like this before, and because of that I am drawn to photograph these little details. The exterior doesn’t get all the fun here. The inside carries a certain rat rod/50’s flare to it. There are no frills to this truck, and the door doesn’t even fully shut or latch. it is more friction and prayer that keep the door closed. Very little has been updated on the interior with the exception of the gauges mounted below the dash to keep track of how things are going with the V8 under the hood. Something that really drew my attention to the interior happened to be hanging from the rear view mirror. Dean told me that the figure came from a McDonald’s Happy Meal and he thought it worked for the interior of Stitch so he drilled a hole in his head and fixed a hanger to him. I loved the blue hands and the stoic face that really looked like he was willing the driver to slow it down. It was just the bit of detail that I needed to complete this interior shot of Stitch. Hey, anything to help tell the story is a good thing in my mind. When I was writing this blog entry, I really wanted to identify this little guy, but I was at a loss as to who he was and how to get more information. I then pulled out a secret weapon in my quest for more information. I called on my 14 year old Sierra who I was certain would know this guy. Well, she recognized him, but couldn’t place him or advise a name. While we were looking at different things online to try to identify the mysterious fella, Toni joined in the party and sent a picture to the other two kids who were a good bit older. Nobody knew who this guys was. I was getting to the point that I was going to give up because, I’ve been sitting at this computer solid since getting back from this particular shoot yesterday at dinner time. Well, as I was about to give up, Sierra remembered that he was from Skylanders which then launched several specific searches. He has now been positively identified as Kaos, which in a way makes the fit to Stitch even more relevant. There is just nothing subtle or calm about this truck. So, there you have it, after a couple of hours shooting the truck, several hours editing the pictures, and another hour or so writing the blog, the biggest accomplishment is identifying a character hanging from a mirror. Something else that had changed on Stitch from the last time I shot it was the addition of some bling on the front bumper. OK, so maybe this wasn’t blink in the common sense, but when we are talking about rat rods, bling can be any number of things. In this case, there is the addition of a worm gear from a steering rack on each corner of the bumper guard. Of interesting note, while I was setting this shot up, I was using the gear to focus on, so I was zoomed in tight on it. I could actually read the serial number on this gear which was really cool to me. That was something that I had missed looking at it in person, but was able to see it from a couple of feet away. This shot also showcases the barbed wire used in the grill guard which I think is just fantastic. 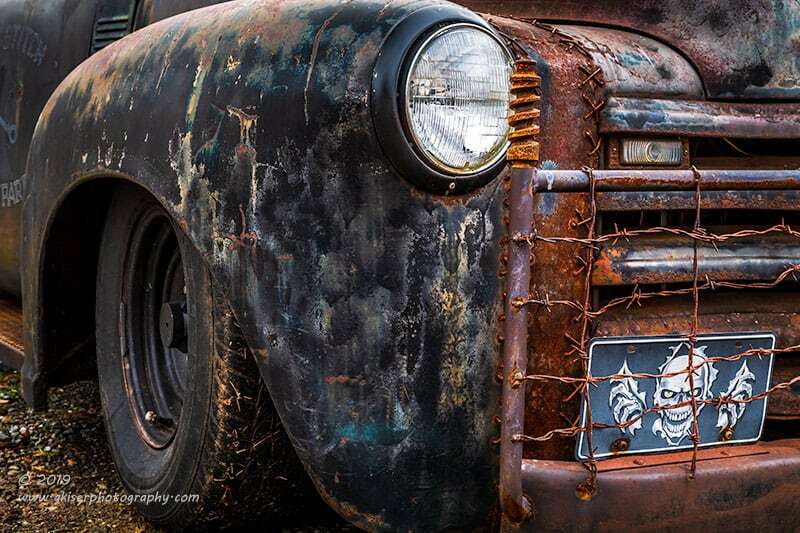 The front plate hidden behind the barbed wire adds to the personality of this truck so well. 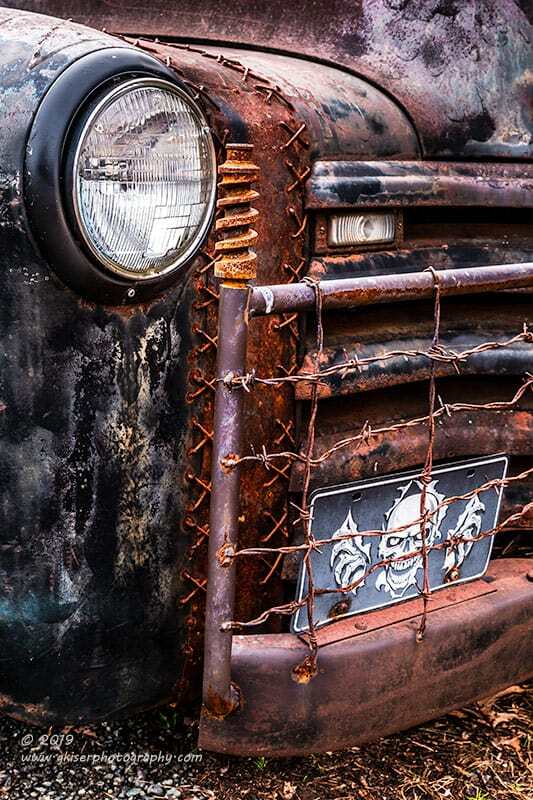 The skull and hand ripping through the metal looks very similar to some of the scars on this old truck. Everything about this truck goes together, even if there is no way possible for them to do so. That is all due to the creativity of Dean who has built this truck from the ground up. Another one of the defining characteristics of this truck is the bed. As you can see, it is heavily customized with the bed floor raised way up to the top. The fender flares have long since been removed with the suspension dumped to the ground. Since over the top is what this truck is all about, the dual rear wheels are huge and required cutting the bed rails to allow clearance. With anything this extreme, you know there will be issues popping up occasionally. Dean was telling me that recently he hit a bump in such a way that the suspension flexed and caused the tire to make contact with the edge of the bed rail. This tore part of the tire tread off and bent the rail slightly. Dean handled this little hiccup without batting an eye. He just trimmed the rail a little bit and viola…perfect fit at full flex. Like he says, he enjoys working on rat rods better than restorations because you don’t have to worry about body damage or scratches. Cut it, bang it, beat it, weld it…whatever it takes and you are back out on the road again. I know that Dean is working up to selling Stitch and that is the hard part about being a builder. He has to clear out his collection before adding more to it. He’s been working on this truck for a very long time and has gotten it just right. It is street legal, registered and insured. I’m not sure what he will be wanting for it, but dang, I am almost inclined to see if I could possibly get it. It is completely impractical, but sometimes it is fun to be a little crazy. I’ve seen this truck through different stages of life and know a good bit about its story. 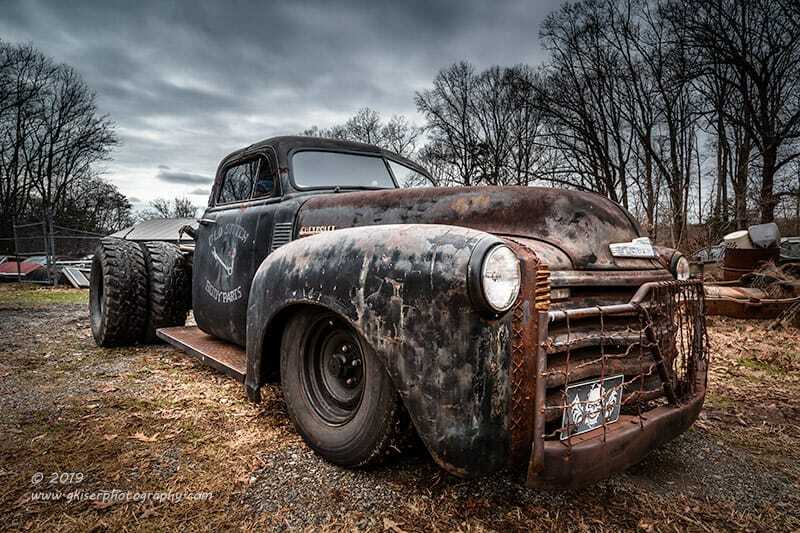 I do know that it is a monster and really looks the part of a rat rod. Following it down to the shop where the photo shoot was, I was surprised at how quiet the engine was. I was really expecting more hoopla going down the road, but it just flat went and made no bones about it. It is low, wide, and menacing. It is definitely a head turner wherever it goes. 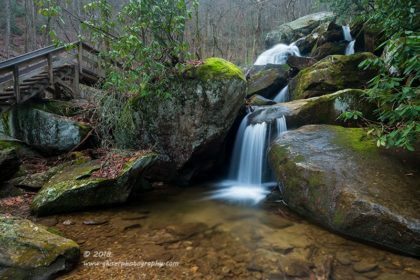 I can hear a photographer friend of mine laughing at this shot proclaiming that he has no idea how I come up with the names of some of my images. Yeah Scott, I really pulled out the stops to title this piece. This is less an art piece, and more just the standard engine shot. I mean, I was doing a full on photo shoot, so I kind of had no option in the matter. I chose to do a heavy vignette around the edges to remove the distraction of the background. This wasn’t quite the dramatic shot that I had with the Cadillac Limo powered by a diesel engine back in the Summer, but there are some little details that are worth seeing. The most notable is the battery box which carries the theme of the stitches to the edge welds. 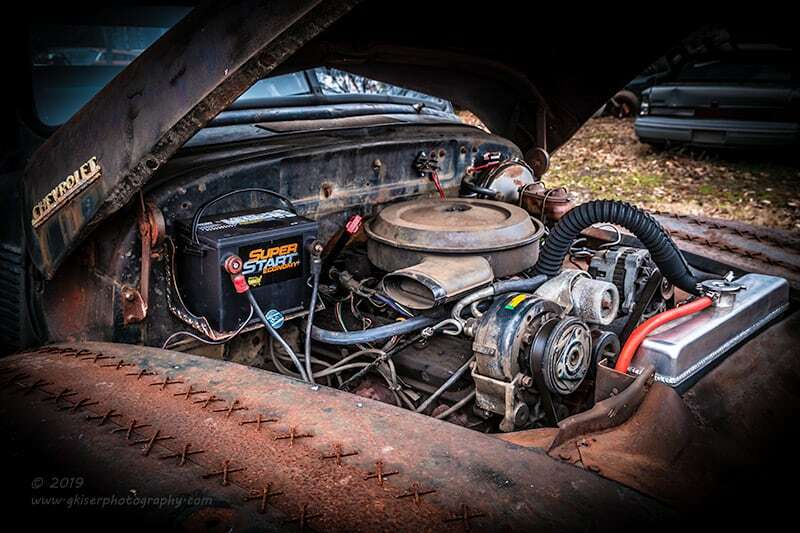 The fender stitches are the perfect foreground for this image and blend quite nicely with the battery box. I also like the bit of bright work on the radiator top tank. It looks completely out of place under the hood, but still totally fits the part. This is a really cool truck all the way around! Yeah, I know….more pictures of rusted stitching. I’ve said it before, and I’ll say it again, these stitches are great for abstract work, and when you look at the driver’s side front fender you can see where the fender has been massaged after some body damage. 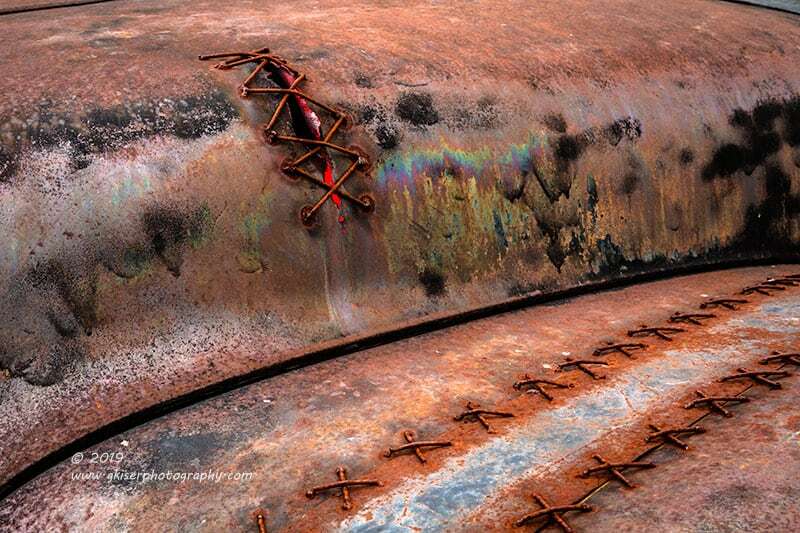 The way the rust followed the waves and ripples reminded me of a throbbing vein on a forehead. With that and the stitches, this shot somehow gives life to the truck and anthropomorphizes it in my eyes. That is what makes this particular shot so interesting. For me, this is a great example of my wabi-sabi approach to photography. There is beauty in the decay of all things. Here we not only have the rust, body work, faded paint, patina, but there is also rather pronounced ripples in the metal. This is something that most would want smoothed out and corrected. That doesn’t fit with the wabi-sabi concept. With that concept, there is beauty, even in the damage. I agree with that, and find this image really satisfying as an abstract shot. I think I was working on this truck for a total of maybe two hours. In that time, I shot about 60 frames. Of that, I came away with 13 images that I really liked, some of those I really love. It was a fun assignment shooting Stitch in the salvage yard with the other cars in the background. They didn’t make it into many of the images, but they really helped in the ones that they showed up in. I really enjoyed the detail shots on this truck as well. I might have watched Stitch grow up over the last year, but I think I learned more about the nuances than I ever thought I would. This is an amazing creation and Dean is a true artist. Whoever ends up with Stitch will be a very fortunate individual. No doubt about it, this is a one of a kind truck, and I’m proud that it has found its way in front of my lens on more than one occasion.